With Jonathan Allen and Daron Payne anchoring the defensive line, and Adrian Peterson hardly looking like a 33-year-old, the Washington Redskins have established what sort of team they are. It's quite a drastic shift from who they've been under coach Jay Gruden until now. 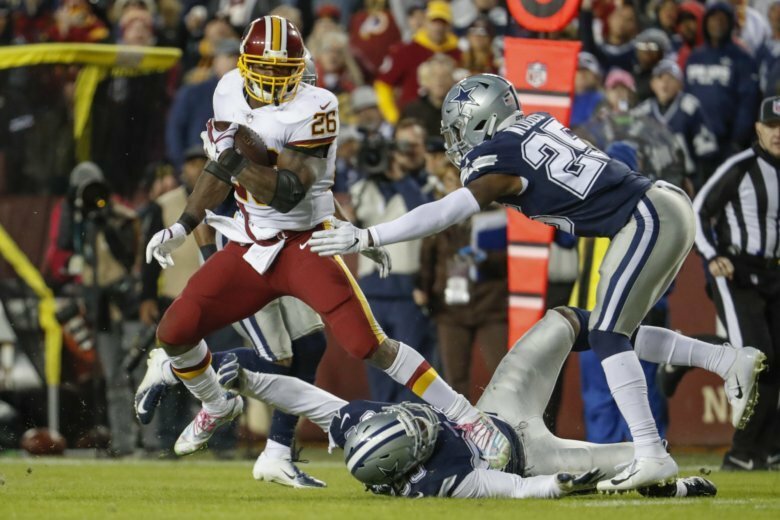 WASHINGTON (AP) — With Jonathan Allen and Daron Payne anchoring the defensive line, and Adrian Peterson hardly looking like a 33-year-old, the Washington Redskins have established what sort of team they are. It’s quite a drastic shift from who they’ve been under coach Jay Gruden until now. Their defense stops the run — gasp! — and their offense — get this! — moves the ball on the ground. He was talking about Washington’s defensive front, but he also might as well have been referring to the offensive line, which is led by left tackle Trent Williams and right guard Brandon Scherff and has been leading the way for Peterson. So bad against the run for so long, the defense is suddenly stout as can be. It limited the NFL’s No. 2 rusher, Ezekiel Elliott, to 34 yards — his second-lowest output in the league — in the Redskins’ 20-17 victory over the Dallas Cowboys on Sunday. Elliott’s longest gain was 6 yards. That came a week after the Redskins limited Christian McCaffrey to 20 yards rushing and the entire Carolina team to 81 during a 23-17 win against the Panthers. “We’re making teams earn every blade of grass they get,” Gruden said. Now comes another test for Washington, which leads the NFC East: rookie sensation Saquon Barkley and the last-place New York Giants next Sunday. The Redskins are giving up only 87.3 yards on the ground each game, third in the NFL. One key: Washington is one of two clubs to not have allowed a 20-yard run this season. Minnesota is the other. Last season, Washington owned the worst run defense in the NFL, with opponents rushing for 134.1 yards per game. In 2016, it was 24th of 32 clubs at 119.8 per game allowed. And in 2015, 26th at 122.6 per game allowed. So this season has seen what Gruden called “a major improvement,” one he attributed in part to the pair of first-round draft picks out of Alabama, Allen (who missed 11 games as a rookie in 2017 because of an injury) and rookie Payne. Safety D.J. Swearinger nicknamed that duo the Alabama Wall. On the other side of the ball, Gruden has embraced the running game much more than in his previous four seasons as a head coach in Washington. After Peterson’s 99 yards on 24 carries against the Cowboys — the fourth time in six games this season he’s topped 95 — the Redskins are third in the league at 29.5 runs per game and 14th at 119 yards per game. Those numbers are way up from the full 2017 season, when the team ended up ranked 24th with 25.1 runs per game and 28th with 90.5 yards per game. Under Gruden, the Redskins have never finished a season averaging more than 26.8 carries or 106 yards per game. They’ve also never had Peterson, who was available to any team when the Redskins signed him in the preseason. Notes: Gruden said that CB Fabian Moreau sprained his ankle and RT Morgan Moses injured his elbow against Dallas. CB Quinton Dunbar, who missed Sunday’s game with what the team said was a bruised shin, was going to get checked out to see whether he had a nerve problem.